There are thousands of time capsules buried by school children, civic leaders, colleges, and hospitals across the country every year in the United States. It's fueled by that indomitable optimism about the future we humans seem to have. We bury things and think future generations will find them - and care. There are thousands of time capsules buried by school children, civic leaders, colleges, and hospitals across the country every year in the United States. It's fueled by that indomitable optimism about the future we humans seem to have. We bury things and think future generations will find them and care. Time capsules were a big deal when I was a kid. It was 1976, America's bicentennial, one of those grand occasions when grown-ups take stock of where we are in this moment in time, and school kids make projects. I felt a part of something bigger. A part of history. "There's something primal about time capsules," says historian Paul Hudson. "It's like buried treasure� I as a child would bury things and quite often dig it up in the afternoon I would be so excited to see it." Hudson still feels that excitement. In 1990, he co-founded the International Time Capsule Society at Oglethorpe University in Atlanta. You might be surprised that such an outfit exists, but the society's got a big job. It's trying to register America's estimated 20,000 time capsules. You see, we love to make time capsules, and gather the ephemera of pop culture: the wonderbras, beer cans, newspapers. Something we've touched will be remembered long after we're gone. It's a kind of immortality for ourselves, and our objects. Almost. "What happens to most time capsules is they become lost or forgotten," says Hudson. Hudson thinks the fate of time capsules reflects the foibles of human nature: we have the best of intentions, but we're disorganized and forgetful. Some time capsules, even if they are found, turn out to be disasters. Tulsa, Okla. unearthed its 50-year time capsule in 2007. There was a lot of excitement because the city had buried a car. "It was covered in what looked like mud, which turned out to be more concrete than mud," says Bob Carney. Carney's family won that car that had been soaking in an underground tomb for 50 years. The two-toned 1957 Chrysler Belvedere with fins, "Miss Belvedere" as she's known in Tulsa, has spent the past year and a half in a New Jersey auto-body shop that's volunteered to clean her up. Carney admits people are intrigued just because she's the time capsule car. "It's part of history, I guess. You know?" Tulsa has a new time capsule car stowed away until 2047, this time above ground. Fifty years falls within a human life-span. But some time capsules hope to reach people much farther into the future. The Crypt of Civilization at Oglethorpe University was sealed by Dr. Thornwell Jacobs in 1940, to be opened in 8113. Hudson calls it "the granddaddy of all time capsules." Hudson says Dr. Jacobs was inspired by the ancient Egyptian pyramids which were accidental time capsules. Instead of a Rosetta stone to decode the contents, the Crypt of Civilization contains a hand-crank machine that will teach anyone basic English. "People used to ask Dr. Jacobs, 'What will life be like in 8113 AD?'" says Hudson. "He said he could no more envision life in 8113 AD than Cro-Magnon man could envision the skyline of New York." Time capsules are as American as apple pie. Hudson thinks that's because we're a young country, impatient to make history. Other countries stumble across ancient artifacts every time they build a road. But technology is making it easier to reach future generations. We have the ability to store vast amounts of digital information far above our earthly fray. The European Space Agency is planning to launch a satellite into space that intends to contain messages from all humanity. Four pages are reserved for each one of us. Space isn't a new frontier for time capsules. Physicist Carl Sagan included "the sounds of earth" in the Voyageur space craft in 1977 with a greeting from the U.N. Secretary General saying "We step out of our solar system into the universe, seeking only peace and friendship." But that was aimed at other life forms out there. The Europeans want to leave something for our descendents 50,000 years from now. That makes Thornwell Jacobs' Crypt of Civilization a mere baby-step along the way. "Fifty-thousand [years] was because in our history - the human history on earth 50,000 years ago, for the first time, the human body was drawing somewhere," explains Patrick Tejador with the European Space Agency project KEO. Humans were drawing in caves in France and in Africa. It was no New York skyline, but it was human beings' first art. Patrick Tejador says it's our turn to create a message for the future. "In thousands of years, your own message will be read by someone in the earth. So someone will think to you at that time." It's a nice thought. But suddenly I'm feeling very small. The bicentennial time capsules I made when I was a kid made me feel big and important. We had modern inventions compared to those founding fathers in their silly hats. But 50,000 years from now, will they find our messages? Time capsule historian Paul Hudson doesn't make me feel too encouraged about that. Outer space seems like an even bigger place for something to get lost, forgotten or ruined. But we have to keep hoping. That's what humans do. When I was a child back at Elba Elementary school in lapeer michigan, we buried a time capsule also.Is there any way to see if it has been dug up yet or if it has been forgotten about? I would love to see what I put in it since 30 years ago I can't even remember what it was. Here in Jefferson City, Missouri we had a party on Thomas Jefferson’s birthday in the spring of 2008 and assembled the materials to be put in our time capsule. 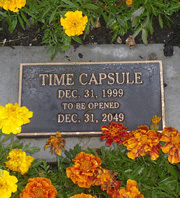 The time capsule category was used. Originally a skeptic of time capsules, we all enjoyed the excitement of documenting our part in the Lewis & Clark bicentennial. We were optimists just like those adventurers of 200 years ago.